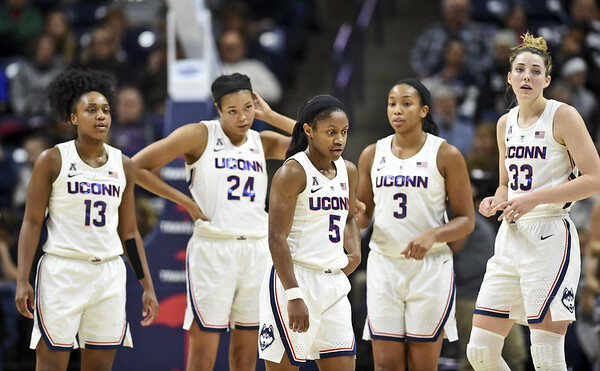 STORRS - The occasions that the UConn women’s basketball team overlooks or looks past an opponent happen about as often as it has losing streaks. But Sunday was one of those times. With South Florida here without four key players including its three top scorers, the Huskies figured they’d have to do little more than show up to produce another American Athletic Conference win. Geno Auriemma, however, showed his starters that would not be acceptable. The Hall of Fame coach emptied his bench after watching his first five get out-hustled, outworked, and outplayed in the opening 4:35. While the starters returned and made their presence felt in a 63-46 win over the Bulls at Gampel Pavilion, the way they won left a sour taste. “Sometimes it just doesn’t look right, and it didn’t look right,” Auriemma said. “It has gotten to the point in coaching that you just make suggestions to players, you can’t tell them what to do. You just make a suggestion. If they want to do it, they do it. If they don’t, they don’t. So I suggested that they sit down. So we were even. UConn (14-1 overall, 3-0 AAC) trailed 6-4 when Auriemma made his mass substitution. After falling into an eight-point hole, Molly Bent and Kyla Irwin hit consecutive 3-pointers to get it back to a two-point game at the end of the period. The starters were back to open the second quarter. UConn led 26-20 at halftime and pushed it out to 46-30 after three quarters. USF (10-7, 1-2) cut the gap to 10 and had the ball with 3:50 left, but a stop on the defensive end and a Megan Walker 3 started a 10-0 run that put away the Huskies’ 27th consecutive win over the Bulls. But much of the discussion during the postgame was about the beginning and not the finish. Samuelson finished with 19 points and became the 10th UConn player to reach 2,000 with a third-quarter layup. If one starter was involved for 40 minutes whether on the court or on the bench, it was the Huntington Beach, California, native. Walker (14) and Napheesa Collier (12) joined Samuelson in double figures. Crystal Dangerfield struggled with her shot (1-or-8) while fellow guard Christyn Williams (0 for 2) hardly shot at all. Bent started the second half in place of the freshman. The Huskies start a two-game road trip on Wednesday at Tulane (13-3, 3-0) and then travel to Philadelphia for Sunday’s matchup with Temple (4-11, 0-3). Posted in New Britain Herald, UConn on Tuesday, 15 January 2019 21:22. Updated: Tuesday, 15 January 2019 21:25.